A few years ago, on a day when I felt overwhelmed by stresses and tensions and discouraged by observing conflicts where resolution seemed impossible, I browsed through prayers on the Laudate app on my phone and landed on the Chaplet of Divine Mercy, which I had never really said before. I said it for the first time, and I found that it really helped to calm me down and to place my burdens in the hands of God. Its refrain—”have mercy on us and on the whole world”—dares to ask for forgiveness and mercy for the whole world; it covers all the disagreements and tensions and misunderstandings I’d witnessed, all the things I’d done to make things worse, the mistakes I’d made, and all the things others had done that had caused pain. It professes trust in God in everything, even amidst suffering and confusion. 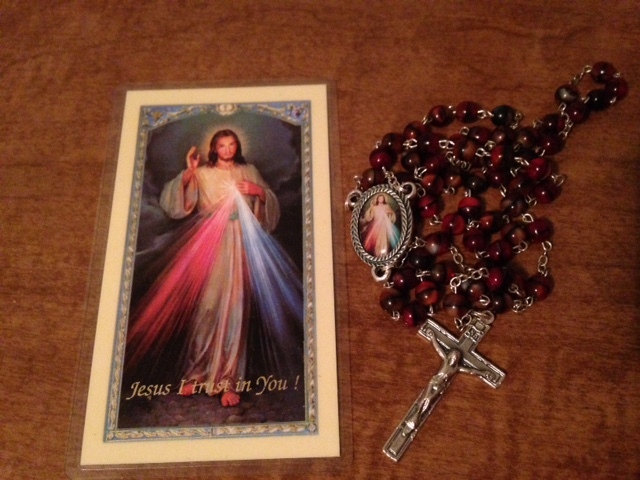 Since it was almost Lent, I decided to say a Chaplet every day as part of my Lenten practices. The habit stuck, and I’ve said one nearly every day since. It takes about seven minutes for me to say a Chaplet—just enough time to pull me out of the world and into a different frame of mind, but not so much time that I can’t fit it into the middle of a busy day. I’ve also been inspired to read more about St. Faustina (the originator of the Chaplet) and her writings, and her message is so simple yet powerful and profound.